The other day Darrin at Dads Dish Retro, blogged about his daily primping routine, which for some odd reason reminded me of my dad. As you're reading this, I am actually away. Hubs and I are visiting my dad at his Florida home and in honor of my dear dad, I'm going to tell you about two scents that will forever remind me of him. These scents are in addition to the weird jar of waxy stuff he often used to clean the grease and motor oil off his hands after working on cars. Once old enough to date boys, I secretly prayed they'd never use these two products. There's something icky about my guy smelling like Daddy. Luckily none of them did. However, I bet by now those original scents have since been updated and no longer even have that original Daddy smell. For example my two favorite childhood shampoos, Finesse and Suave, smell much different these days. Ironically, my Mother-in-Law has this odd habit of asking me what perfume I'm wearing and actually purchases it. We've had about three of the same perfumes since 2002. I probably shouldn't admit this, but one day I had the nerve to say, "If I'm making out with my man, I really don't want him to think I smell pretty, just like his mom." Not sure who I embarrassed more, hubs or his mom. Oops. HA!! Great insights and ponderings!! Ya know.. I'm digging Old Spice lately! Just for the fact that it's an awesome aftershave!! I was kind of apprehensive to using it at first, and only bought it for old times sake, but I actually enjoy using it now! I guess it doesn't matter that I smell like my old man used to. Heck.. I'm an old man myself now I guess. LOL! P.S... Thanks for the link love!! Oh yes! My dad used Old Spice too. We sued to buy it for him for every holiday. I think if I smelled it today I would cry! I miss him! Haha. Funny. I'm with ya on this one. 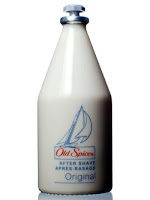 How I miss my Dad's Old Spice, as well as his cranky old self. Yep. Just mentioning Old Spice brings back memories. What is it they say?... smells have the strongest attachment to emotions. I believe that! My dad used speed stick and old spice. Anytime I smelled either of them I takes me back. I might to have buy them and occasionally break them out so my kids can have the memories. LOL. Mmmm. My Dad always smelt like old spice too. Must of been men of a certain vintage. Takes me back. Waaaay back. Lol. My Dad used both of these products daily. He always smelled like a preacher. It's just an ongoing greek tragedy in your household. haha. From an advertising perspective it's amazing to see Old Spice once again become a hot seller just from the TV spots alone. From a social perspective of you worried about guys wearing daddy's deodorant before making out with them. Ewwww. Boy + Girl + Daddy? Has TV movie of the week written all over it. Hope Fla. is fun. I don't what registers more. The commercials these products used to put out or the scents themselves. Dad used both of these. The creepy thing, is my brother started using a certain kind of men's cologne, and then later a guy who was sweet on me used the same. Once potential BF material smelled like my brother, we were never going to be anything that resembles a "we". I have always been creeped out by Old Spice. Reminds me of my Grandpa and Dad and then that wierds me out. My guy is into Axe for his hygiene and it smells just fine. My dad used old spice, and I did too for a while. But really, I don't wear cologne at all any more. No reason to at the job I have, and besides, perfume and cologne on other people bother me...I am just sensitive. I definitely try to keep my mom away from my body sprays and body washes. I don't know why I'm so territorial about my scent, though. It's kind of weird. Ah frickety frick. Blogger ate my comment. that'll teach me to snicker. I'm allergic to both. Can't be around people with either or my nose starts itching like mad. That's just awkward about your MIL. My dad is super against fragrance like at all, so that was never a real issue for me. My husband however, sits and obsesses over getting new deodorant and will stop in Target and smell like 5 or 10 of them to find his new favorite....I don't know he's a nut.....but we certainly had a discussion right after we got married that he could not use a certain fragrance of speed stick cause he smelled just like an ex boyfriend of mine. I buy my dad a bottle of Old Spice Original after shave every Christmas. If I didn't he'd be upset. I don't even know how much of the stuff he uses to be honest, but ever since I was a baby that's what I get him. My brother, my highschool best friend, and my highschool boyfriend all wore the same cologne and I HATED it. The smell was awesome but making out with someone who smelled like my brother was just ... icky. Hmmm...I used to always ask my hubby (when we were dating) what cologne he was wearing and he always said none...it is my deodorant. Jergens lotion reminds me of my dad. ha... my grandaddy is what i think of with old spice!! !